The that time of year! Mariah Carey is already overplayed on the radio and the Jeopardy! Tournament of Champions is back, and one of the contestants is dreaming as big as any of us can hope to dream. Finalist Austin Rogers, a bartender from New York, 12-time Jeopardy! champion, and “sassy bearded man,” as our friends at AV Club put it last week (he hardly has a beard now), won $411,000 and secured himself as a finalist for Thursday’s show, where he’ll have a chance to win another $250,000. That’s right. He’s going to travel the world in a Mercedes-Benz wagon—specifically, a 1991 W124 300TE 4MATIC wagon. He’s got it all mapped out. The plan is to buy a W124 in New York City, drive down through South America, up through Africa to Europe, across to Vladivostok, then back through India, over to Australia, and then hop over to Alaska before driving it back to New York City. The car’s a great contender for this. 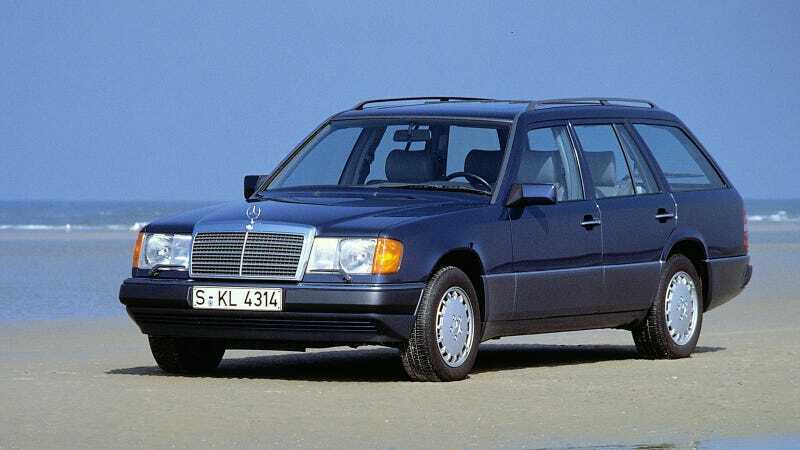 That vintage of Mercedes-Benz (technically the S124 in wagon form) was among the last of the brand’s truly overbuilt and over-engineered cars. It’s tough, reliable if you care for it properly, comfortable, and in wagon form, exceedingly practical. Austin made a solid pick for such an arduous journey, and if he found a car that’s been cared for, he could potentially pull it off. I don’t follow the show but I’ve been informed Austin is a favorite, and after that answer, how could he not be. Apparently he’s climbed to moderate fame and wants to write a book. If he pulls this off, I’ll buy a copy AND try to get it signed. I’ll also be hunting for that wagon on Craigslist. I have no shame. Or maybe you fine folks can hunt for an example he should buy. Thanks to Mark for sending this tip in! You Too Can Build A Chopped, V8-Powered W124 Benz For Just 500 Bucks!